Sudah lamaaaaaaa (seriously… no joke…. ) I haven’t been shopping online for anything but iTunes card. Let alone buying any luxury items for meself. But today… today, my friends, my mood was bad, temper flaring up, and body temperature was higher than a tiger in heat, I saw the bag. Some might not understand it, and boys will roll their eyes, but it’s LOVE AT FIRST SIGHT! Since I am bed bound and can’t go any further than the kitchen, a lack of anything better to do triggered the knitting frenzy. 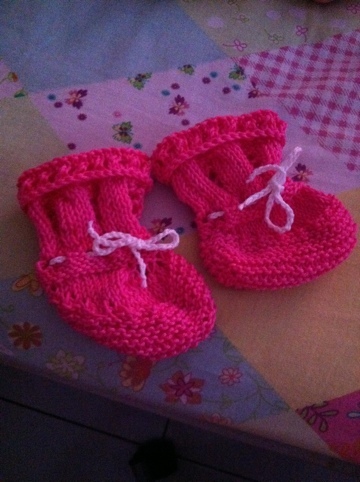 This is going to be the first and hopefully not the last booties I made for protege #3. Let’s just hope I don’t run out of yarns to play with. Meow!!! Nothing to do with the Walking Dead. It’s just THAT phase of the pregnancy where my brain thinks 3 hours of sleep is enough. I’ve been up doing work since 2.30am and there’s no indication that my brain is slowing down. Nothing interesting on TV so I’m stuck with watching the Fashion Police making fun of people on the SAG award red carpet. And ooOOOooo… Natalie Portman’s pregnant belly is huge! I thought she just got pregnant?! Ok… Ice cubes time. I’m back. So what’s with the ice cubes? It’s called PICA. This usually occurs during pregnancy where you go crazy and want to eat non-food items. Orang kita kata ‘mengidam benda pelik-pelik’ la… Nasib baik la I only feel like chewing ice cubes and not selipar jepun (yes people… I have friends who craved for selipar jepun… Don’t ask me how it ended…). 3rd protege update? Went for my checkup with Abu yesterday. Baby looks great and healthy and Puan Doktor estimated her weight at 34 weeks is 2.66kg. Since I still have another 4 to 5 weeks more (Puan Doktor said might even be 3 weeks more! ), the baby final weight should be around 3kg. I’m already having regular pains and walking around feels like climbing mount Kilimanjaro nowadays. What I need now is a good massage. Every single freaking day until I give birth, I wish I can go for a good whole body massage. And I also want to eat lots and lots of icy stuff. Not normal ice cream. Tutti Frutti frozen chocolate yogurt or that Snowflake Taro balls thingy. Wokeh… It’s 3.47am and I think I need to try and sleep or stare at the ceiling or watch the Mentalist until I fall asleep. So, good morning to those who will be up and running in an hour or 2, and good night to those zombies like meself!